Search by journal title or by subject area. Then click the resource containing the needed date range. A "discovery service" system set up to search many of our electronic databases with a single search. Find articles from scholarly journals and e-books across multiple disciplines and access full-text from YU-subscribed resources. Find Materials Your Professor put "On Reserve"
2. If you are off-campus or in the dorms, log in using the instructions below. 3. Search the system by department abbreviation, course number/name, or instructor. 4. Enter the course E-reserves password your professor handed out. 5. Locate the links or pdf files assigned by your professor. 2. Search the system by department abbreviation, course number/name, instructor, or title of the book. 3. Write down the Call Number of the book. Reserve books have a 2-hour loan period for in-library use only. Overdue fines are 25 cents per hour per item. 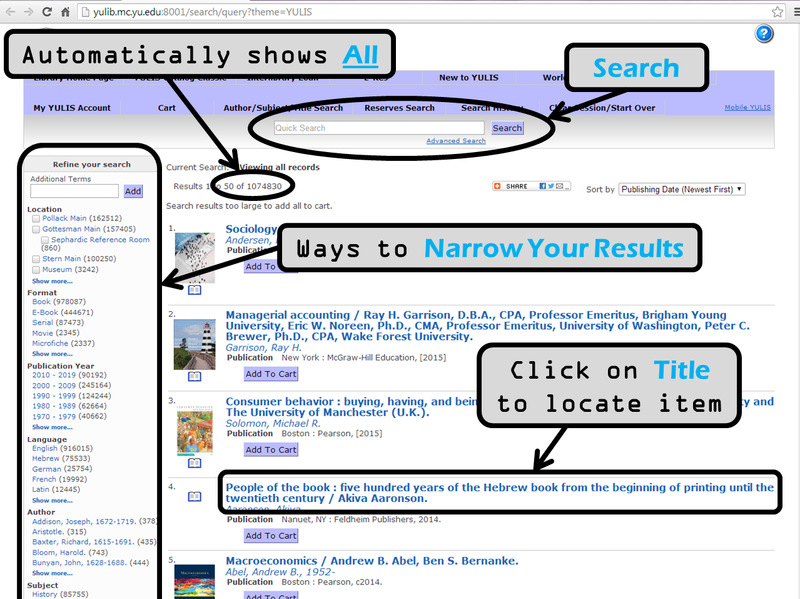 Search here to find books, e-books, journals, e-journals, DVDs & etc. that the library owns or subscribes to. Direct links to electronic resources. Locate books or other materials in the Beren Campus Library. Locate books or other materials in the Wilf Campus Libraries. All of the databases that YU subscribes to. Browse by title or subject. Need Something YU Libraries Doesn't Have? Search thousands of library catalogs. Link directly to YULIS Catalog records and online sources. Request an interlibrary loan by clicking "Request Item." The library will request any book or article, etc. for you from other libraries around the country. A free service. Which library is it in?